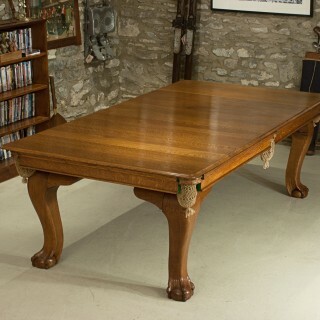 A fine quality 7 foot oak dining snooker, billiard, pool table by E. J. Riley Ltd., of Accrington. 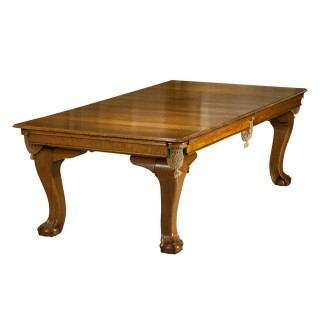 The dual height billiard dining table has cabriole legs with ball and claw feet and a five leaf dinning top. 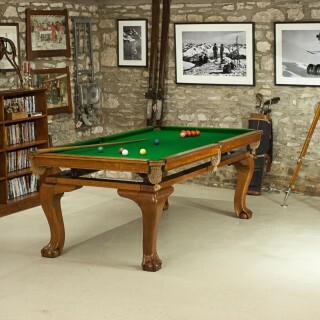 The leaves turn the pool table into a dining table and the purpose for dual height is so the table is at the correct height to dine from (when in the low position) and with the use of the patent rise and fall lifters the table can easily be raised to the correct height to play a game of snooker, billiards or pool (34 inches high). 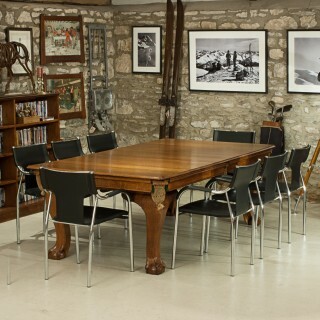 The table is in good usable condition with new cushions and cloth. Supplied with a set of snooker and pool balls, 1 rest and 2 cues. 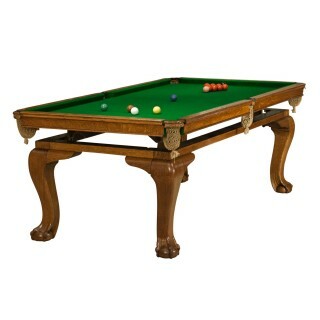 Antique Oak Snooker Table, Billiard or Pool, Dinning Table by Riley.